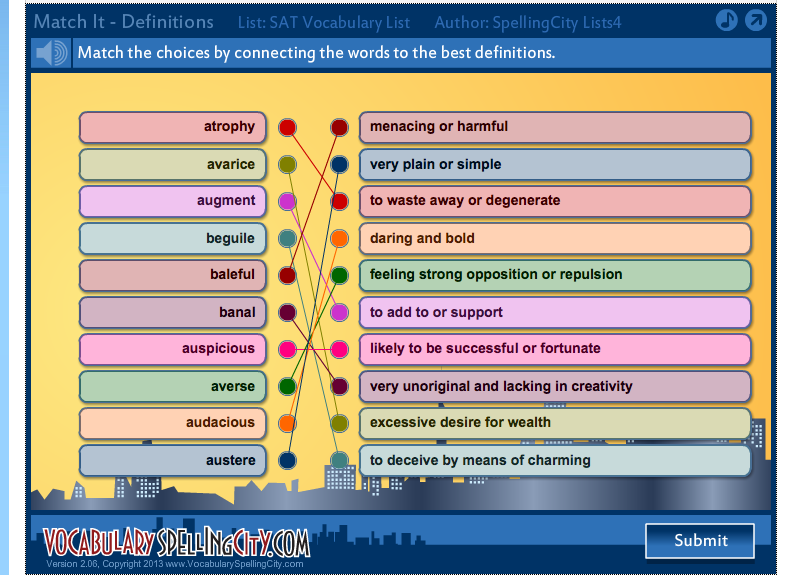 VocabularySpellingCity is an online, game-based way for students to learn vocabulary and spelling. There are two kinds of membership - one is free but with limited access, the other is a premium membership that allows full access to the site's entire repertoire of word lists and games. 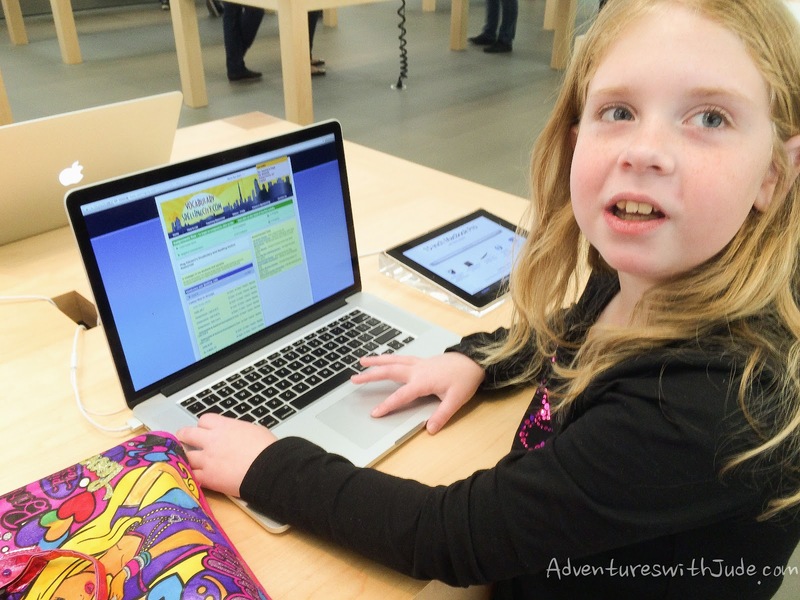 Our family received a premium membership that allowed all five children to test the site out. I was very excited because this is a program that ALL students can benefit from, regardless of where they receive their education. Often I am skeptical of free vs. premium memberships. Most times, premium memberships don't give you enough value when compared to free options. 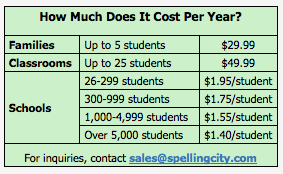 A VocabularySpellingCity premium membership is $29.99 per year. Perhaps I'm biased because we had so many users, making the cost-per-child ratio lower - so on one hand, you could say "At six bucks per kid -- how can you go wrong?" However, even if I had ONE child using this, I think it's worth the cost. The flexibility of this program amazes me. First, there are several more activities available to the premium member. 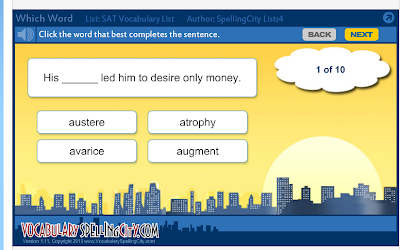 In fact, the entire "learn the words as vocabulary" program is open to premium members. This alone makes it worthwhile -- I think knowing what a word means often helps gives clues to how the word is spelled. I love that this program is multisensory - hearing, seeing, tactile interaction. Some of the activities are basic, dry, "match the word with the definition," which really is a necessary part of learning vocabulary. VocabularySpellingCity tries to make it fun, but sometimes, you have to accept that matching definitions requires memorizing. However, the program tries to use different methods of presentation to help students learn. Vocabulary is presented as "Choose the correct word from a multiple-choice list," "Use context clues to put the word in a sentence," and "Match the lists." With several ways for a student to learn and manipulating words on a list, the focus is on the activity, not on "Oh, I never can remember this word!" or "This activity doesn't help me!" Speedy Speller, another premium game, requires the student to master both accuracy and speed. For my in-school two, this is really helpful, because when they have their weekly spelling tests, the teacher only spends a minute or two on each word -- either you know how to spell it, or you don't. Speedy Speller helps them learn the word correctly AND quickly, so they're prepared for the next word when it is given. Speedy Speller takes away the "OH no, I only have 30 seconds to write the word," because they know can do it (correctly) in nine, still leaving time to go back and make sure penmanship is legible. For my homeschooler, Luke, speed is still important. When he needs to write timed essays, he can't spend all of his time trying to figure out how to spell a word. Second, a premium membership is beneficial for homeschooling mamas because it will track progress - and grades - as well as assignments! I'm not opposed to grading tests, but really - if I have the opportunity for an independent grader to give me a number to throw in the grade book, I'm happy. While I'm not grading the little boys, Luke's spelling and vocabulary scores are being averaged into his subject grades - even math. To me, it's just as important that he knows the language of what he is talking about, not just that he can move the numbers around. Celia has generally been a good speller, but she has more confidence going into her Friday tests. Matthew struggles with remembering vocabulary, and the extra practice has definitely helped him, bringing his grades from failing into C territory. (Hey, it's a hard-won C, so I'll take it!) However, watching his grade creep up each time he repeated a week's assignment meant that words were "sticking," and he felt prepared to take the in-school test on Fridays. He felt like he would be able to do reasonably well, rather than being resigned to just going in and letting whatever he knew come out and result in yet another failing grade. 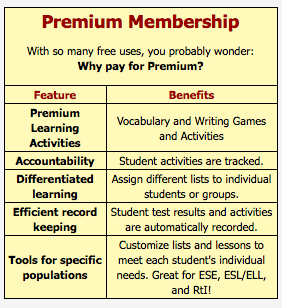 The premium membership also allows me to customize a program for the individual student. 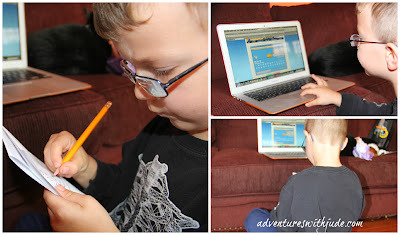 Each child has his own login within our family's account, so I can assign tailored programs to each one. For example, I can assign the PK Dolch words for the little guys and the high school word lists for Luke, but none has to sort through the others' assignments - each gets his own list. I can choose the activities assigned to each student based on what they need (Damien isn't quite up to learning definitions - I just want him to start understanding that letters make words), and what they prefer (Luke likes the matching definitions, Matthew prefers an extra round of sentences to help him cement context clues.) I like that I can set the programs to "lock" the order -- this way, they do the "practice" tests first and then the final test last, rather than "getting it over with" and failing before taking the opportunity to really learn the words. Third, these games are FUN. Ok, maybe there wasn't a whole lot fun about a spelling test, but learning the words sure was. 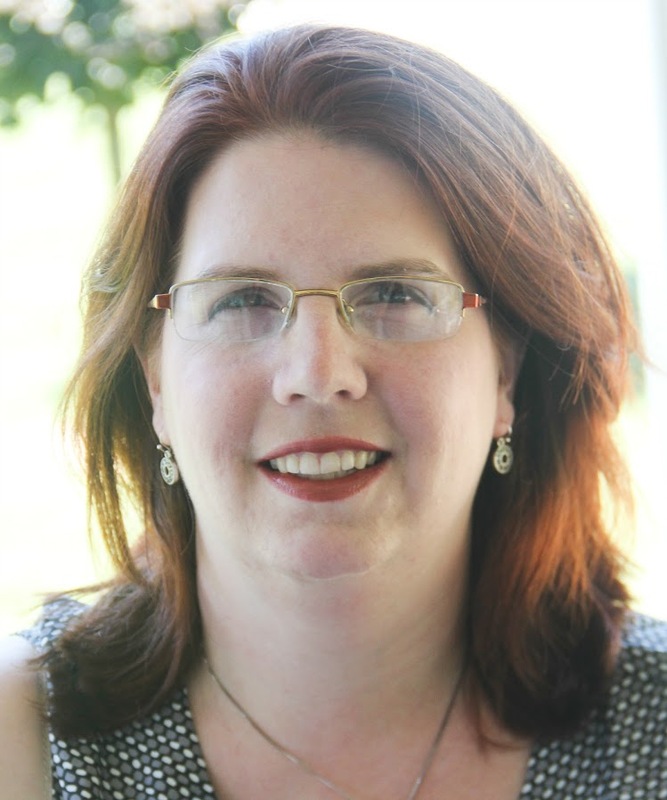 VocabularySpellingCity is a family-owned educational software company with nearly 40 employees dedicated to creating "game-changing" educational systems. The founder, John Edelson, has a history in the gaming industry that stretches back nearly 30 years and includes producing the popular game "Croc: Legend of the Gobbos." The graphics are crisp and clean regardless of platform - with five students, we employed every one in the house -- Mac, PC and iPad/iPod*. They are age appropriate regardless of level - our family's favorite game (HangMouse) was simple enough for the younger ones yet still considered whimsical by the older kids. This program quickly became a favorite post-homework gaming activity for Matthew and Celia and an anticipated school task for the others. 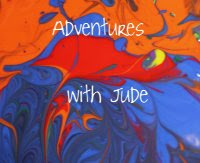 *Note: due to programming issues, the iPad/iPod App does not support all of the activities. My face value, non-techie understanding is they require something iOS doesn't play nice with in order to work. However, if we only had an iPad as our only way to use the program, I would still consider it worthwhile - out of 28 activities available to a premium member, only five are not available via App. All of the other non-game features, including recordkeeping, are still supported. There is one more population I want to focus on: the student in the classroom. We are a hybrid schooling family. Because of having homeschooling brothers, Matthew and Celia had the opportunity to try out the program, and it really worked for them. I am a huge proponent of cutting back on homework. I can see where some work has merit, but when you have a child like Matthew who is simple done by 3 pm, it's a fight that I don't look forward to. But he NEVER considered this as homework. This was a game. This was fun. Yes, as a 7th grader he realized it was educational, BUT he was willing to work on it. 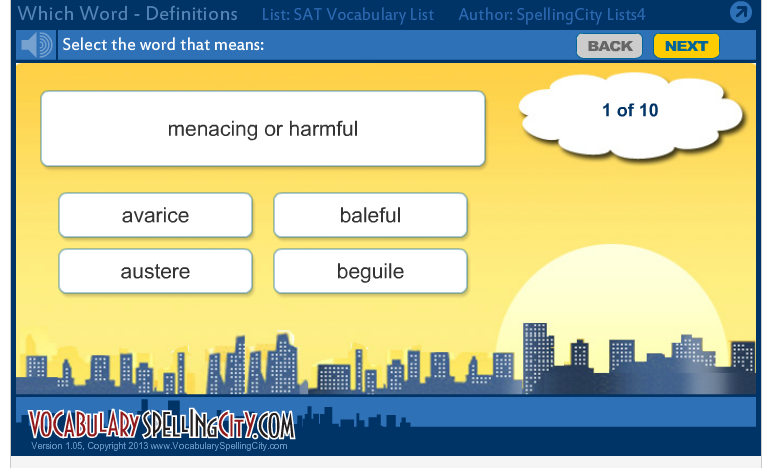 In fact, he would hustle through his homework in order to not lose "SpellingCity Time." One afternoon, I had to go to the Apple Store to get Jude's iPad repaired, and Celia disappeared into the sea of "Try us" laptops. When I went to tell her it was time to go, she said, "One more minute...I'm playing Spelling City!" I wish we had known about this program sooner. Having seen Matthew's grades go up so dramatically in four weeks, I think this could have saved us a lot of drama and tears. It's also been far more effective than his usual Vocabulary homework. I couldn't tell you the last time his vocabulary grade was above an 80; he even got a 100 on the spelling portion of the test. I also intend to discuss with his teachers the possibility of implementing it school-wide, because I can't believe I have the only student that struggles with learning spelling and vocabulary. I know that our school's budget is very tight (what school's isn't these days?) but I feel that this is something that the Curriculum committee really needs to consider. We have reviewed a number of other programs that could be used by both home- and "regular"-schoolers alike, but this is the first one where I've felt that the program has filled a niche that nothing else I've seen can. And, at less than two dollars per student, I think that even a modest fund-raiser can add this to the curriculum and reap great rewards. There were only two major problems that I found with the program. Dictation during tests. This was probably the biggest problem we had with the program. 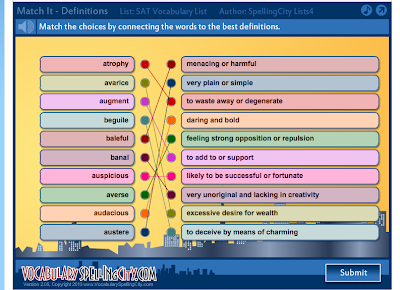 When taking the spelling and vocabulary tests, many words were said so quickly that they were hard to hear. At first, I thought it was just Luke (he does have some auditory processing issues), but then Celia remarked she couldn't understand, either. I sat in on a test with each, and wasn't sure what was being said, either - even when I had the word lists up on my screen. When I re-tested them verbally myself, they both knew the correct spelling of the word and the definition, so it was definitely a testing issue, not a learning deficit. During other spoken activities within the program, the dictation was not as hard to understand - it was better enunciated and at a still rapid but more easily understood clip. But for the tests, it was said quickly and too evenly - with no appropriate syllable stressing. Some games really need a word bank or list. I had to print out/handwrite lists for games such as "HangMouse" and Crossword really could use a word bank, especially for younger students. Without the words next to him, Jude got every attempt wrong at HangMouse -- after all, when you're just learning words, do you know how many three letter words are out there?? A LOT. But with a list in front of him, he was able to not only complete the task without tears, but use process of elimination - "The word 'and' has three letters, let's try A...ok, there's no A in the word, so that means it can't be 'can' either..let's try F for 'for...'" or "Ok, the A is in the middle, so it's not 'and' but it could be 'can,' so let's see if there is a C." Even for Celia and Luke's words, having a list at hand was helpful. This way, their focus was on the six-letter words on their lists, not needing to memorize a list so they knew which words to recall. 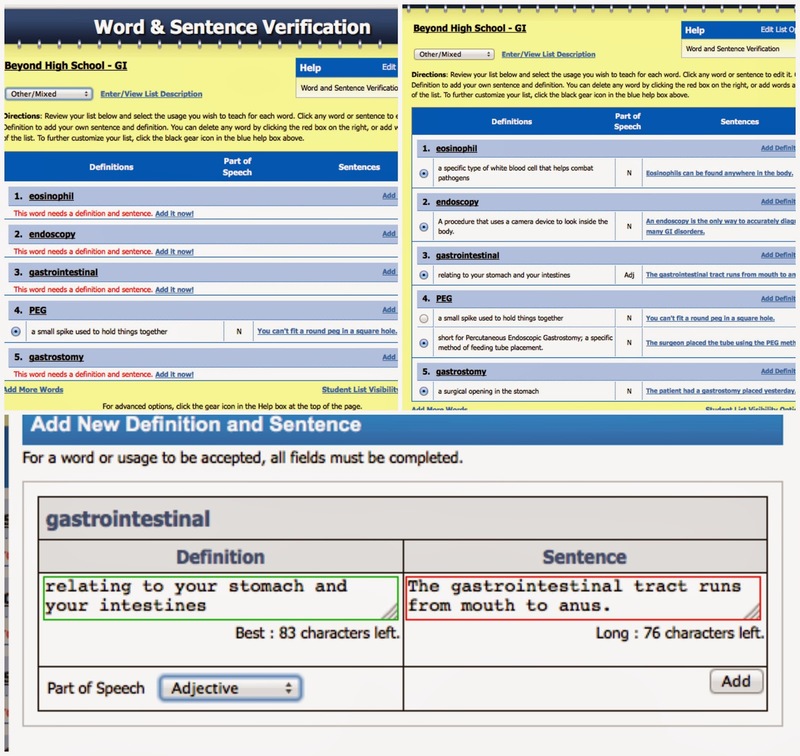 While we solved this by copying the words down ourselves (not inherently bad because that added another way of learning), it would be nice if there was a word bank option (even a drop-down hint box) so that the student was not trying to play and keep track of a printout all week. 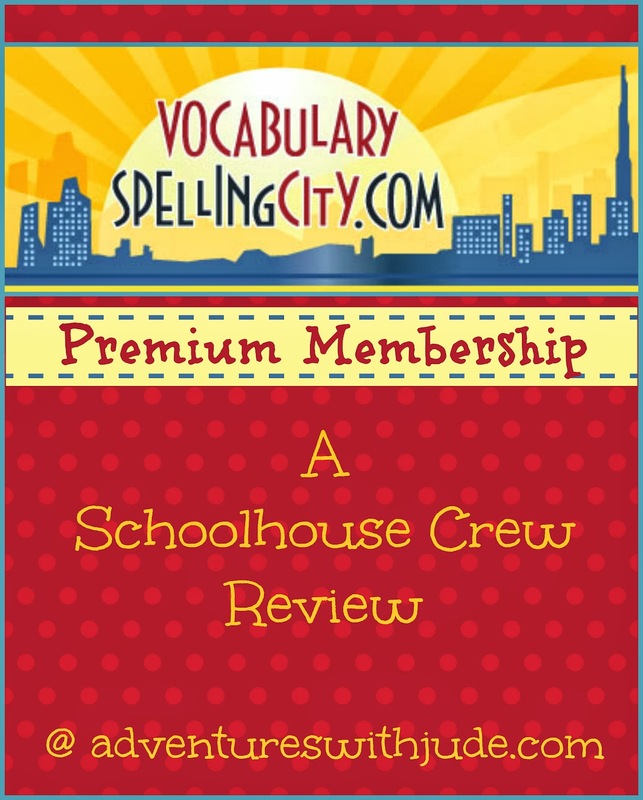 VocabularySpellingCity's Premium Membership is a program that I am very, very happy to have had to opportunity to review. 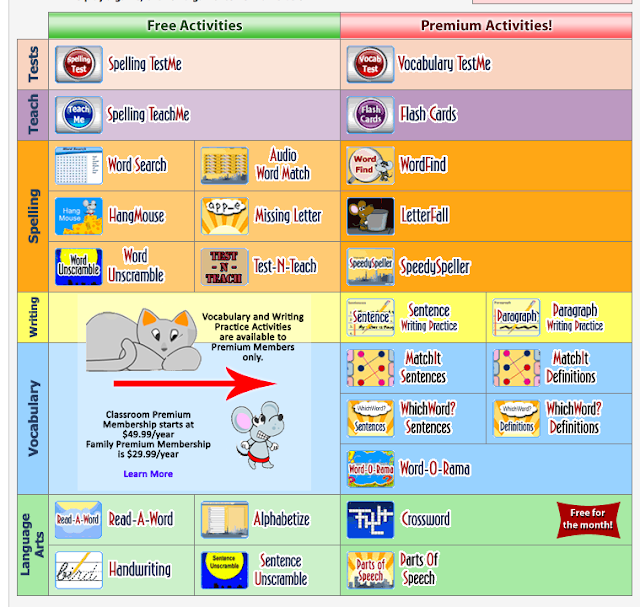 A nice balance of "traditional" word-and-definition learning and classic games, it has provided all of the students in our family - from PK through High School - a multisensory way to learn and reinforce learning vocabulary and spelling. The Premium membership has been worthwhile for the homeschoolers in our family, providing individualized programs and recordkeeping, while the "regular" schoolers have been able to work on their own teacher-assigned lists as well. This program is Fun ("With a Capital F," says Matthew), far more engaging than another worksheet, and provides instant feedback and a second chance if a wrong answer is given. 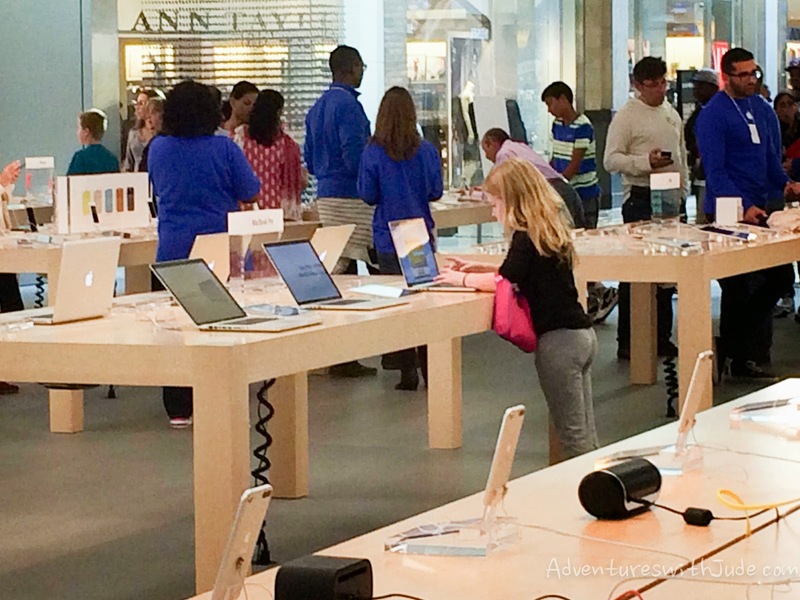 Having the iPad App option really came in handy - one child could work on a computer while the other was on an iPad. This is a program I look forward to continuing to use for a long time to come. 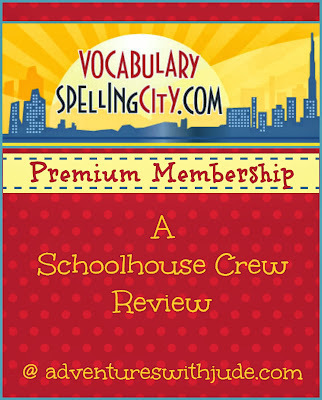 100 members of the Schoolhouse Review Crew have been using VocabularySpellingCity. Find out what they thought of the program by clicking the banner below.